Surfing Surfboards Lost Surfboards Lost Evil Twin Lost Evil Twin PU/Poly 5'9"
Lost Evil Twin PU/Poly 5'9"
The ...Lost Evil Twin is a convertible hybrid surfboard with a wide range of use in varying wave sizes and break types. “The Evil Twin, in addition to its convertible, multi-fin, adjustability, the most unique feature is its elevated ‘e-wing'." 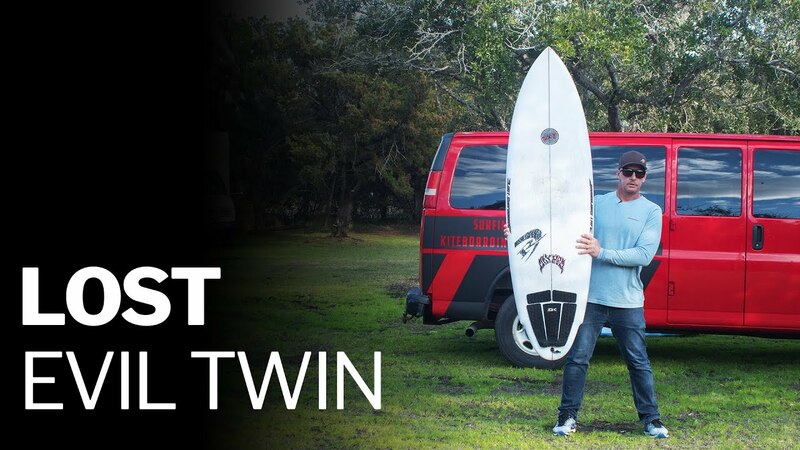 The ...Lost Evil Twin is a convertible hybrid surfboard capable of being set up with several different fin configurations including single, 2+1, twin, twin plus trailer, and equal tri (thruster). The outline features a wider nose to moderate width, then into E-wing round tail. The rocker is generally flatter throughout. Stock set up includes future boxes up front and a short single fin box out the back. The Evil Twin can also be custom ordered through REAL with FCS2 boxes up front. •Wide, flat nose for easy paddling and glide. •Moderate width for added power in softer surf, and control in juice. 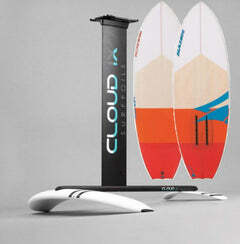 •Convertible fin set up: Single, 2+1, twin, twin plus trailer, equal tri (thruster). The ...Lost Evil Twin has tons of range and a variety of fin set ups. We tested our Evil Twins in Cape Hatteras, North Carolina and also in Puerto Rico. The multitude of fin set ups allows you to dial the board in to the conditions or your mood for the day. This variety and range, also make it an incredible travel board, as it eliminates the need for extra boards based on different size and types of waves (within reason). Taking one board on the plane or to the beach is far easier than three. Especially when you’re the passenger, or traveling with a group, and space is tight. We were able to surf the Evil Twin in everything from knee high, cold water mush, to overhead Caribbean juice. We ran through all of the fin sets ups including single, 2+1, twin, twin plus trailer, and equal thruster. Our favorite and rangiest set up for just leaving it as is and surfing, was the twin plus trailer. 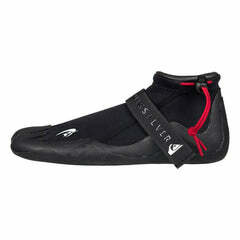 For this we used the Futures ENs , or for lighter surfers the T1s , with the Evil Twin solid fiberglass trailer fin. You can tell this fin was custom designed for this board by the overhang they built into it to get the fin into the right position. We pretty much rode it all the way back in the box with the overhang going over the board. You can adjust the position of the trailer if you want. Sliding it forward tightens your fin cluster and loosens up the board. Moving it back makes the board more predictable and stable at higher speeds, better for when the juice is on. Single fin: buttery smooth, likes a predictable, slower breaking wave. 2+1: (single + side bites ) similar to single fin but with a bit more pivot and a bit more hold on the wall of steeper waves. Twin: great for flat faced waves where you’re looking for friction free flying down the line. This is one of the fastest set ups but some surfers commented you lose the tail a bit in hard turns on hollow waves. They all commented after a few surfs it’s something they got used to and could avoid. Twin + trailer: the ...Lost Evil Twin trailer allows you to lock in the twin fin speed and looseness with a small finger trailer set back in the box. 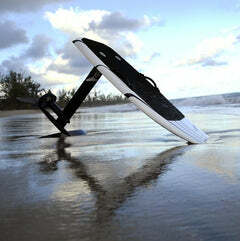 This makes the board more stable and confident, especially for those not used to twin fins. Equal tri (thruster): Futures and FCS both both make rear thruster fins that can be used in a single fin box. From our experience, the FCS Performer Connect thruster trailer fin works better here, as it’s a tool-less fin, that doesn’t have the screw down tab up front to limit its positioning. This turns the Evil Twin into an Evil Thruster, and is a great set up for better waves, or those born and bred on thrusters. The E-Wing adds width when you need it for softer conditions. 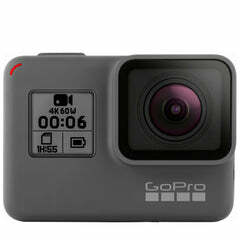 It also adds bite, and a bit more rail rocker to help it hold when the surf turns on. One one Puerto Rican wave in particular, we got the board up to total warp speed mode backside and threw the hardest turn of the trip off the top of the wave, fully hoping it would hold, and it did! Hands down best turn of the trip, and proof that this flat rockered board can hold at high speeds. Overall, the Evil Twin has a very wide range of use both in wave size and type. With regards to the board itself, the design was more than powerful enough to grovel, but also had elements that kept it fully in control when the surf got good. This has us in the fun zone no matter what we rolled up on. For a limited time ...Lost is supplying all Evil Twins, stock and custom order, with their ...Lost Sinister Single Fin and Trailer fin, both designed and constructed of solid fiberglass by Futures fins, free of charge. 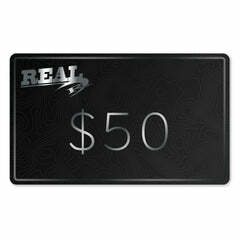 This is a $91 value and a special Evil Twin launch promotion available for a limited time, while supplies last. The ...Lost Trailer Fin is designed for this board with a good sized overhang to get the fin far enough back when moved to back of the box. Take care when installing and removing this fin, so you don’t poke the fin through the fiberglass. The Futures EN twins have a similar overhang on the trailing edge. Go slow and steady and you’ll have no problem. Custom making this trailer fin specifically for this board allowed ...Lost to use a shorter single fin box, and still get all the fin placements correct, which cleans up the underbody of the Evil Twin. Fin auto corrects to “Fun” which is so perfect for this write up, because it is a lot of fun! Variety is the spice of life. The ...Lost Evil Twin allows you to have 5 boards in 1 to cover a wide range of conditions and moods. This is definitely one of the more “out there” boards ...Lost has come out with, but it definitely works well and is one you want to check out! The ultimate transformational fun machine kit… and expand your horizons beyond your wildest dreams. literally making thousands of them, across various models. Now, for the first time, we are introducing e-wings globally. The elevated wing works with parallel outlines, allowing increased lateral speed, then drastically reducing surface area in the tail, to control and carry the speed into tight radius arcs. They create hyper extended rail rocker, which rolls into the wave face easily, engages and holds in turns. Positioned near the rear foot, e-wings add forgiveness, control, and ease of roll, to relatively wide, high volume, flat rocker boards. 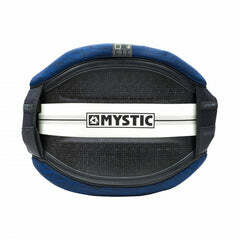 MR inspired Flat deck, and steep, tucked soft, rails, combined with a shallow single concave through the center. Low tail rocker, with deep double concave vee, which works with the rounded pin tail, to balance speed with control. Wide forward outline, with low entry rocker, that glides effortlessly. Single Fin, solo: For minimalist point and glide, soulful arcs and long carves. Lovely in lined up point breaks. Single with forward “Side-Bites”: Adding a bit of pump and slam to the single fin jam. The Side-Bites engage with the e-wing and raise the performance level. Especially in larger surf. Twin Fins: Loose, quick and eternally playful in small surf. Free flying fun without the slidey surprises of wider tail twinnies. Twin + Trailer: Locked and loaded twin fin with overdrive. Confidently carve and surf with power in all sizes of waves. My favorite set up for this board. Thruster: For all you “Pro-Formance” peeps. 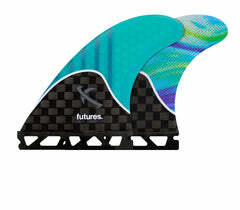 Futures offer a rear thruster fin for the long box, which turns the EVIL TWIN into a Terrorizing Thruster. We have worked with Futures to develop both a 6.5” performance “Sinister-Single” Fin and a 3.5” Rear-Trailer Fin, specifically for the EVIL TWIN. Use them in conjunction with any one of Futures’ readily available Twin Fin and Side-Bite option. Lost Evil Twin PU/Poly 6'3"
Lost Evil Twin PU/Poly 6'2"
Lost Evil Twin PU/Poly 6'1"